I was recently inspired to write a short story based on a true event that happened in my NY hometown during the Civil War. A train of Confederate prisoners of war came through en route to a POW camp and left a dead Confederate behind. The townsfolk debated over what to do with the boy. The men didn't want anything to do with the Reb while the women thought that the boy should be buried in their cemetery. Unknown Confederate soldier buried not far from me .... hmmm, this is prime writing material! 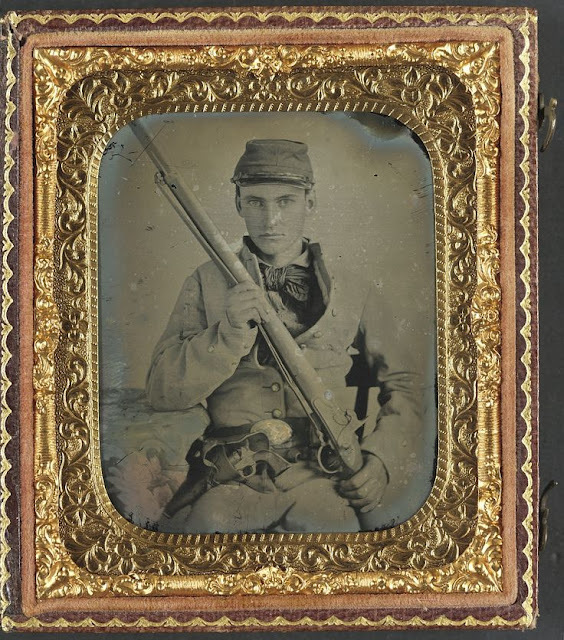 So without further ado, my little story about a Confederate soldier boy. “Ain’t we goin’ through enough torture with you singing atop of that?” Someone’s yell cut through the melancholy tune. The voice was bitter. A scuffle began, and the singer disappeared into the men, getting pummeled by the bitter soldier. The boy leaned his head into his knees, shutting his ears to the misery. A cold sweat slathered his youthful face, and his body trembled and convulsed with fever. He was going to die. He knew he was going to die. The question was—when? The noise gradually settled down and the boy heard someone sobbing. He wondered if it was the bitter man or the singer. He glanced up at the soldiers around him. They were stoic, staring at the walls as if in another world. What were they thinking of, the boy wondered. Home? The future? The past? “For fuel. Sit back and get comfortable. We have a long ride still ahead of us, Reb.” The federal soldier had begun to close the door when the bitter man plunged forward. The man pointed to the corner where the boy’s body lay. The federal soldier pushed his way through the group, two more soldiers following suit. They picked up the boy by the arms and legs, stumbling to the caboose and off the train. A crowd of townsfolk had gathered at the site of the POW train, curious to get a glimpse of a Reb, or perhaps mock them to their faces if they had the chance. Widow Hudson pushed through the surly men as they cursed the young boy who lay on the earth before their feet. Her breath caught in her throat when she realized how young the boy before her was. His face was smooth, his full lips were parted and his golden hair was tousled about his head as if he were just a child sleeping. ooh, love this Emily! quick question though: was he really from TN or did you just create that? Love reading these short stories you do! Oh, so sad! Especially the last sentence: "I wonder what his name was." Poor boy. It must have been exciting to find such an interesting piece of history though, right in your hometown! "I wonder what his name was."